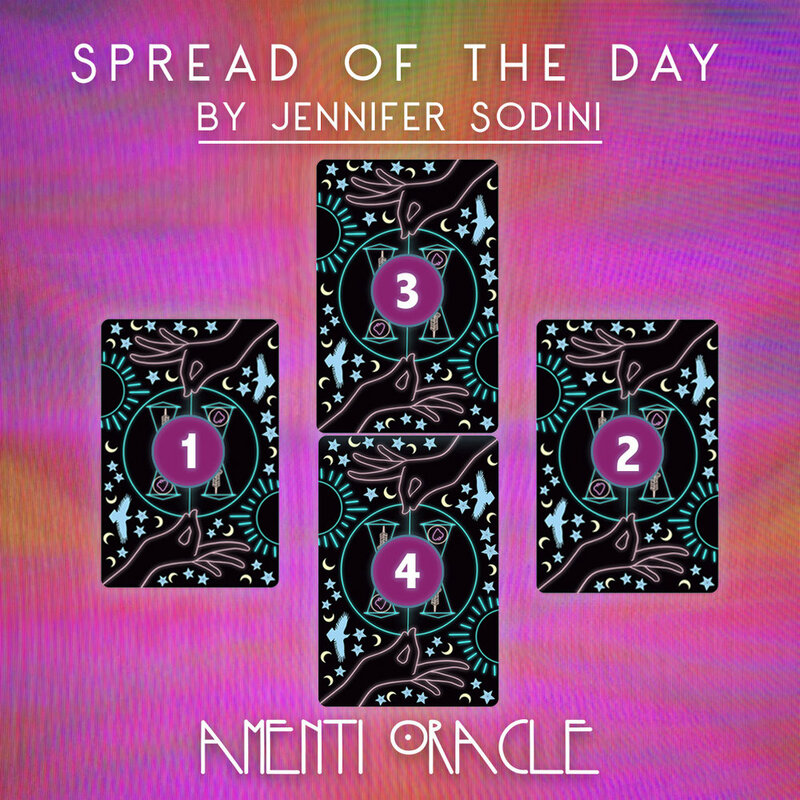 My forthcoming oracle card deck, Amenti Oracle: Feather Heart, is now officially available for pre-order! To celebrate the upcoming launch (it’ll be available everywhere books are sold on 5/14) - I’ve decided to give a sneak peek of the cards, and use them for this week’s oracle card reading. Check out the reading below, and let me know what you think! CARD 1 (REPRESENTING LIGHT): WHAT DO I NEED TO BRING TO LIGHT, IN ORDER TO FIND A DEEPER CONNECTION TO AN ILLUMINED HEART? The card pulled reminds us that in order to connect to a heart that is illuminated in the light of truth, we must connect to our relationship with virtue. Beyond any religious system or polarizing view-point, virtue (stripped of dogma) is the energy of embodied action in alignment with the heart. Who are we behind closed doors? What are we closeting that we are afraid to bring to light? Where does vice trump virtue in your life, and how can connecting deeper to this ideal absolve (and resolve) the patterns that perpetuate from unhealed trauma? Look to the present moment, and meditate on the shards of time that have left subcutaneous wounds in your spirit. Once the pattern is identified, light can heal that which is revealed. CARD 2 (REPRESENTING SHADOW): HOW CAN I WORK WITH MY SHADOW, AND FIND A LESSON IN THE DARKNESS? Honoring the goddess and the god, is not about deification - but instead, personal apotheosis found through harmonization of paired opposites. "Male" and "female" // "masculine" and "feminine" seen as energy, beyond the illusion of gender. By doing shadow work, and connecting to the card at hand, it may be beneficial to inquire as to where we are out of balance, and how we can correct imbalance through equilibrium. Are you too logical at times? So much so that you forget the power of intuition? Or, are you too in the clouds, that you forget linear time, and have trouble being present in this reality? By seeking a relationship with the middle path, the shadow can walk with you, instead of clouding your vision. 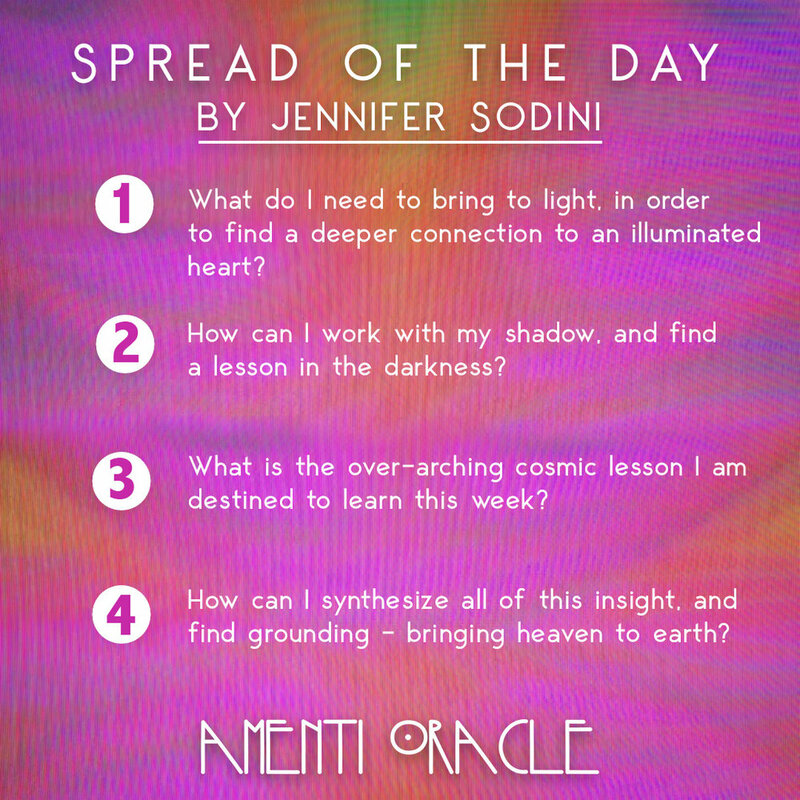 CARD 3 (REPRESENTING COSMOS): WHAT IS THE OVER-ARCHING COSMIC LESSON I AM DESTINED TO LEARN THIS WEEK? The overarching theme/lesson of the week is to find, create, and cultivate harmony in your actions, and reactions to self and "other." Polyphonic presence can be felt and observed when we write our soul's sheet music from a consciousness that is aware of the relationship that exists amongst all things. When our intention is placed on the action of honoring and respecting all things that come into our experience, we embody the conduit who conducts all interaction with compassion and creativity. CARD 4 (REPRESENTING EARTH): HOW CAN I SYNTHESIZE ALL OF THIS INSIGHT, AND FIND GROUNDING - BRINGING HEAVEN TO EARTH? Trust. Trust. Trust. When we trust ourselves and trust the journey - we connect to a state of flow consciousness. Life and lessons move with the pace of our awareness, abundance and beauty manifest with effortless ease, fluid motion (and emotion) is found in this space, which allows strength in our convictions and confidence in the great cosmic scheme. Acquiesce into the eternal awe, but bridge the gap between heaven and earth by allowing your mind, body, and spirit to be at peace with the process.